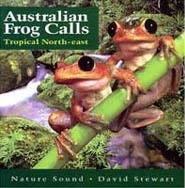 The frog calls on this CD include 67 species and cover nearly all species found in Queensland's tropical north east. Exceptions are Cape Melville Tree Frog (Litoria andiirrmalin), Dahl's Aquatic Frog (Litoria dahlii), Armoured Mist Frog (Litoria lorica) and two Nursery Frogs, (Cophixalus mcdonaldi and Cophixalus peninsularis) - calls of these species are not known to have been recorded. The region is bounded in the south by Rockhampton (Tropic of Capricorn) , extends north to the top of Cape York and includes the Great Dividing Range. The Wet Tropics refers to the World Heritage area of tropical rainforest from Mt. Spec (north of Townsville) to the Big Tableland (south of Cooktown). Voice identification of the species follows each call (with a four second gap to the call of the next species). This will be an invaluable aid for people who want to learn frog calls. By naming the species after the sound, it is considered that the listener is more likely to remember the call. Playing back calls may elicit a response from many frog species. It is therefore more useful to have voice identification following call, in a CD application. Conservation status is noted for each species within this region, but note that this information is based on current knowledge (plus personal observation and consultation with frog specialists), and should only be used as a guide. An assessment of abundance i.e. Common, Uncommon, Rare, Vulnerable and Endangered is provided, although dramatic changes in populations of some frog species can occur very quickly. The status given specifically relates to frogs within tropical north-eastern Queensland and is not necessarily applicable to a species over its entire range. A number of species are listed for Queensland under the Queensland Nature Conservation (Wildlife) Regulation (1997) as Endangered (Schedule 2), Vulnerable (Schedule 3) and Rare (Schedule 4) - these are indicated with a Schedule number where applicable. All others not listed in this schedule are 'common' species under the Regulation. The large genus Litoria follows alphabetical order on the cover. However, some species in this group are closely related, and it can be useful to group these species together, so that calls can be more readily compared when separating species in the field. All five Australian frog families are represented. Families and species are arranged following the order Reptiles & Amphibians of Australia by Harold G Cogger (1996), which is recommended for use in conjunction with this compact disc. This CD has been produced with the support of the Tableland Frog Club.